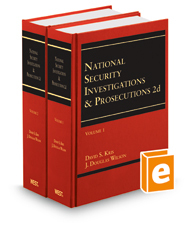 National Security Investigations and Prosecutions presents the law governing, and related to, national security investigations (NSIs). An NSI is an investigation conducted by the United States government to acquire information about foreign threats to the national security, e.g., international terrorism. Serious students of national security law will want to come to grips with the authors penetrating analysis and comprehensive description of this sensitive arena. Our national security depends on excellent scholarship here. John Ashcroft, former Attorney General of the United States. The Constitutionality of FISA without the Wall, FISA "Probable Cause," and FISA Orders as Fourth Amendment "Warrants"